To celebrate the forthcoming minions movie blockbuster for kids, The Langham will host another series of themed sweet treats for families. 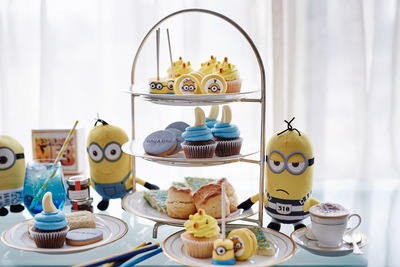 From 3 to 21 July, you are invited to indulge in a delectable Despicable Me 3 High Tea with your little people. The banquet begins on the 3rd July and will run until 21st July throughout the winter school holiday break. There are two sittings to choose from; 10am concluding at 11.30am or 12.30pm concluding at 2pm. The Despicable Me 3 High Tea takes place in the Aria Bar & Lounge at The Langham. Children must be accompanied by a full paying adult, although you will be treated to a grown-up Wedgwood High Tea to enjoy alongside your little minions. Note that children are encouraged (although not essential) to dress up, so think yellow and blue outfits with chunky bottle top glasses. When: Monday 3 July until Friday 21 July at 10.30am until 12pm and 12.30pm until 2pm. Cost: $39 per child, or $49 per child including a Despicable Me 3 plush toy and Despicable Me 3 Minion candy character. Adults $59. Book: Call 1800 641 107 or email rest.res@langhamhotels.com.